In the carolinian and early middle ages, the sounding horn was beautiful, both in sound and appearance, and essential. From sounding orders in battle to calling together the people to flushing out game to communicating to others far away (which I think is cooler and less addicting than cell phones), the sounding horn was an absolute necessity. According to legend, the well-known knight of Charlemagne, Roland, acquired his famous horn by hewing off the head of a ravaging bull as a mere child! I wanted a horn like this, so I looked on google and found instead a link to a video on YouTube on how to make a conch shell horn. We had a rather large Queen Conch, so we made that kind of horn instead. This entry was posted in Uncategorized and tagged 500-1000 A.D., blowing horn, Bone, Charlemagne, conch, horn, Shell on December 27, 2011 by Captain Belaq. A Cameo is a carving normally in stone or shell, and portrays battles, loved ones, Monarchs, and many others. If the carving material is layered, say in three layers, dark, white, and another dark, the artist can carve away the top layer where the face, arms, and other skin would be, carve away the second layer where there would be nothing, and leave the first layer where clothing, hair, sandals and other such things would be. The artist would then carve in the details, give it a final polish, and set it. Early this Summer, we were playing in Whiskeytown lake, and I found a thick piece of white shell. It looked intriguing, so I brought it home. A while later, I started reading up on Cameos, and a spark was ignited. I remembered that piece of shell, so I traced my design on the shell, and used my Dremel to carve it. I gave it to my sister. The Romans were great lovers of Cameos. They normally used Sardonyx, which is the banded white, black, and orange variety of Chalcedony. This Sardonyx mostly came from Crete. 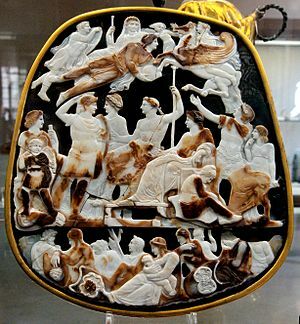 The first photo is of a Cameo called “The Great Cameo of France” made by the Romans around 23 A.D. It is the largest known Roman Cameo in the world. 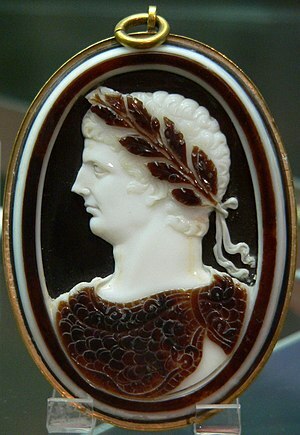 This entry was posted in Uncategorized and tagged Cameo, Roman, Sardonyx, year 0-500 AD. on December 13, 2011 by Captain Belaq.